In March of 2017, I spoke at the San Francisco Public Library for Type@Cooper’s lecture series. My presentation covered the lack of typographic distinction in the tech industry. I included one slide that looked like this. From my 2017 talk at SFPL. Roughly a year later, I wrote my one and (presumably) only viral tweet. It was a version of the talk, but tailored specifically for the medium. If only likes were dollars. Soon enough it had a lot of attention. A little while later, the replies were getting lots of attention. Later, it was a web of discussions with plenty of people talking about the success of individual redesigns, and why they were or weren’t successful. A couple thoughts quickly came to mind. First: I guess this is the first time I’ve said something that resonates. It’s amazing that I’ve posted to that account about 2000 times, and this is the first time that a contribution of mine had struck a chord. Second: the same image, or a similar image had been posted to Twitter before, without getting any attention. I suppose it was the right sentiment, coupled with the right amount of brevity and bluntness at the right time. The responses began floating in, and in typical internet fashion, they weren’t super constructive. I was surprised to see folks jumping in to defend the push toward monotony. “Those original logos make a classic mistake” seems pretty bold, but I think I understand the sentiment. Question: does Leica make a classic mistake? What about Coca-Cola? I think the only mistake here is backpedalling on something ownable. Each of these brands aren’t that unique. When I think of unique brands, my mind goes to See’s Candy and Tony’s Chocolonely. Two fantastically type-driven chocolate brands that, have absolutely nothing visually in common. Two absurdly different brands selling chocolate. Don’t tell me that Uber and Google are that different because they are not. Other good feedback to my tweet centered around the idea that all of those logotypes exist alongside a more distinct and recognizable mark. That’s definitely true, and exposes an interesting thing about Twitter. 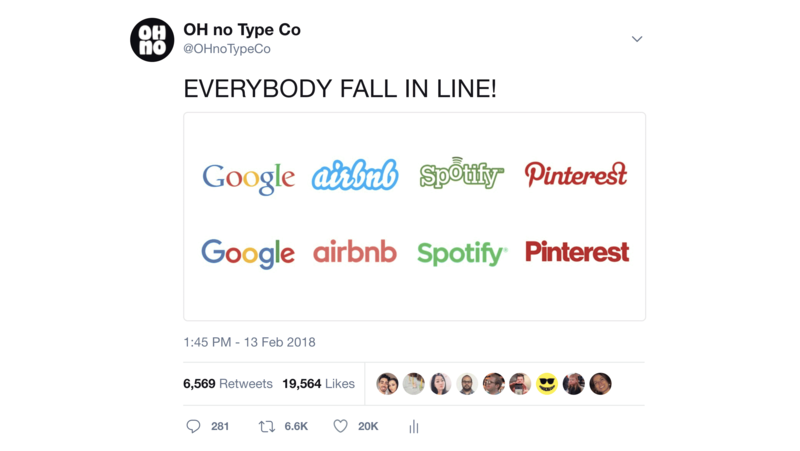 The people that follow me are pretty aware that I’m a type designer that I was making a comment about the homogeneity in the type selection of those brands. My (only) area of expertise is type, so I won’t be making a lot of comments about color, marks, photography, or illustration. But as a tweet’s visibility snowballs, it becomes distanced from any context. Some responses were basically saying, “Branding not just about type!” To which my response is, “I’m not talking about branding at large, I’m talking about type selection as a facet of branding,” but it’s hard to figure out if you don’t know my whole deal. My absolute favorite response came from my good friend Helen Ip. “i'm really not digging tech companies co-opting the roundest sans-serifs. Being round used to be fun and annoyingly non-serifed. Another, longer response in the form of a blog post from Khoi Vinh caught my attention. In his article, he poses some interesting questions.